Thank you for purchasing Pilates Fitness Group Class Bundle! 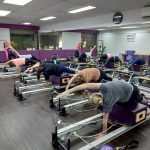 You can use class credits from this group bundle at any Pilates Fitness studios in Singapore. We are glad that we can walk this fitness journey with you! Encourage your loved ones to join you in your fitness journey at Pilates Fitness so that you can motivate each other along! You can share your class bundle with up to 4 other loved ones. Your loved ones only need to sign up with a joining fee of $49 per person to get started!